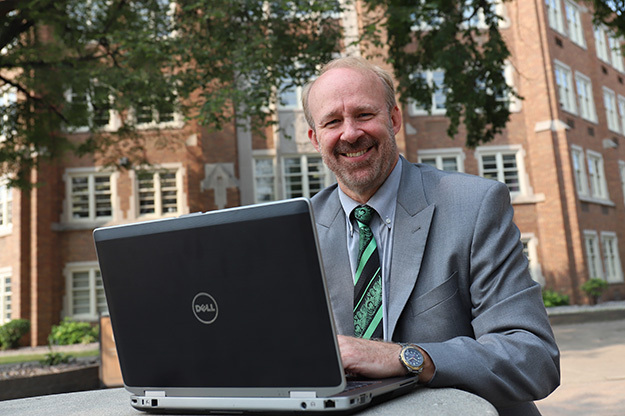 Psychology faculty member Jeff Holm is serving as vice provost for online education and strategic planning. One of his goals is to grow UND’s online offerings and help the University navigate changes in higher ed. Photo by Connor Murphy/UND Today. In the nation and in the state, universities are competing for fewer students and declining resources, and more students are expected to take courses online than ever before. Jeff Holm is focused on helping UND navigate those changes. 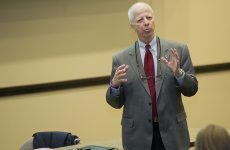 “I believe the data show that universities that don’t change or adapt in the next 10 years will be in trouble,” said Holm, a psychology faculty member who was recently named vice provost for online education and strategic planning. His goals are to boost online enrollment, improve UND’s name recognition nationally and globally, and increase online retention. He will also oversee the University Analytics and Planning office (formerly the office of institutional research and effectiveness). Holm, who is serving as a Faculty Fellow, spends half of his time focusing on online education, a quarter on University analytics and planning and the remaining 25 percent on special projects. He cites two alarming statistics: After the Great Recession of 2008, the birthrate in the U.S. plummeted, and those numbers have not recovered. That means the number of high school graduates – and college students – will also drop. This will add to an already competitive landscape for universities in which many are already struggling and more and more are closing each year. Since 2012, 656 colleges eligible to award financial aid have closed. Holm is focused on making sure that doesn’t happen at UND. He wants to make UND a national resource for high quality, affordable education, both on campus and online. It’s part of the One UND Strategic Plan Goal 3: deliver more educational opportunity online and on campus. He said that our faculty understand that online courses have to be designed appropriately, and we must be prepared to teach online courses differently. The University has engaged Pearson Online Learning to provide services for some programs that UND is currently unable to offer. The first two programs using Pearson services include masters’ degrees in accountancy and cyber security, with more to come. 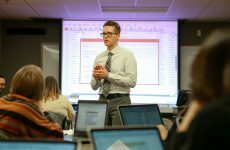 Holm knows that online programs can have higher dropout and lower success rates than on campus programs, and is ensuring these issues are being addressed in UND’s online programs, beginning with those using Pearson services. 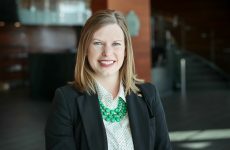 In addition to marketing programs, UND has asked Pearson to provide a “success coach” to help students navigate the higher education process. “One person is assigned to the student, and will follow them until graduation. They will help with time management and help ensure students succeed,” Holm said, adding that he wants to bring that into other programs at UND.